If you ask any professional Excel developer about merged cells, they will almost certainly say something that can’t be repeated here! Merged cells can produce incorrect calculation results, prevent sorting and filtering in data tables, cause errors in macros, and waste large amounts of time when spreadsheets have to be updated. Of course if your spreadsheet is effectively a desktop publishing app, used simply to format and display text, then merged cells can be extremely useful. But not many spreadsheets fall into this category! And actually most of the formatting effects provided by merged cells can be achieved (with just a little more effort) by using an appropriate combination of column width, word wrap, fill colour, and borders. 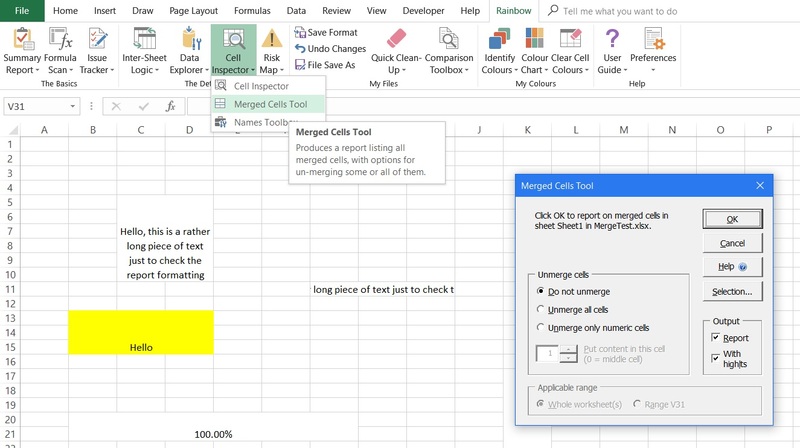 If merged cells are causing problems in your spreadsheet, it’s a bit fiddly to track them down in Excel, and very time-consuming if you need to un-merge them. That’s why we have added a Merged Cells Tool in the latest version of Rainbow, as in the composite screenshot above. And to complement this new function, in the Summary Report we have added a column showing the number of merged cells and their total area. As you can see above, the Merged Cells Tool produces a report listing all merged cells, and it also offers a range of options for un-merging merged cells. These include the ability to place the un-merged content at any specified location within the former merged area (whereas by default Excel simply places the content in the top left corner of the area). So for instance if you have a spreadsheet that uses merged cells to display quarterly results spread across three monthly columns, you can un-merge the quarterly results into the middle column to maintain the same visual layout. As always with a new release of Rainbow, we have also fixed a number of minor issues and made a few other usability improvements. So do try this latest release and see what you think!